2/17/15 Send In the Clowns with Meria and Dave McGowan. 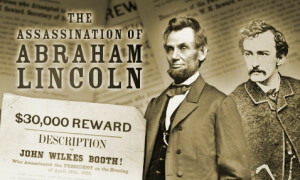 The Lincoln series continues as ridiculous as it was told to us;Latest on Dave’s new book; dozens of people aided and abetted the supposed assassin, most never charged; Dr.Mudd doing his job as a doctor went to jail – he said it was NOT John Wilkes Booth; theater hand Ned Spangler too;surprise: telegraph and gas (for lights) both went down for hours;lack of body guard;broken lock on box; curfew broken to allow escape;similar to 9/11/01-no real repercussions;no autopsy-buried 40 hrs after shot;no real positive IDs; similar to Bin Laden floating in the sea;why didn’t they take Wilkes alive if barn was surrounded? what happened to the horses? crossing the Potomac;Lincoln was hated, similar to George W in many ways;assassination made Lincoln a “saint”; just how did the posse find him? great show. Same M.O. used to this day for most false flag attempts and cover ups. One Response to "Send In the Clowns with Meria and Dave McGowan"
“Send In The Clowns”, fabulous, as usual. The Linconln Series is always so interesting. It’s comforting to know that even back then there were the “I choose to believe my GOVERNMENT” people (as I hear more times than I can count from people when I TRY to talk TRUTH). Anyway, there were also the people who wanted truth…”Conspiracy Theorists”…ha!, and that’s also encouraging. Thanks to you and Dave for another wonderful show!